(Alpine) Author Talk and Booksigning with Rhoda Janzen for her new book, Does this church make me look fat? : a mennonite finds faith, meets Mr. Right, and solves her lady problems. About the Book: At the end of her bestselling memoir Mennonite in a Little Black Dress, Rhoda Janzen had reconnected with her family and her roots, though her future felt uncertain. But when she starts dating a churchgoer, this skeptic begins a surprising journey to faith and love. Rhoda doesn't slide back into the dignified simplicity of the Mennonite church. Instead she finds herself hanging with the Pentecostals, who really know how to get down with sparkler pom-poms. Amid the hand waving and hallelujahs Rhoda finds a faith richly practical for life--just in time for some impressive lady problems, an unexpected romance, and a quirky new family. About the Author: Rhoda Janzen holds a PhD from the University of California, Los Angeles, where she was the University of California Poet Laureate in 1994 and 1997. She is the author of Babel's Stair, a collection of poems, and her poems have also appeared in Poetry, The Yale Review, The Gettysburg Review, and The Southern Review. She teaches English and creative writing at Hope College in Holland, Michigan. Girls’ Night Out presents Rhoda Janzen, author of the #1 NYT-bestseller Mennonite In a Little Black Dress! Rhoda Janzen discusses Does This Church Make Me Look Fat? : A Mennonite Finds Faith, Meets Mr. Right, and Solves Her Lady Problems. RHODA JANZEN -- Does This Church Make Me Look Fat? Bestselling Author of Mennonite in a Little Black Dress Rhoda Janzen Speaking and Signing Does this church make me look fat? At the end of her bestselling memoir Mennonite in a Little Black Dress, Rhoda Janzen had reconnected with her family and her roots, though her future felt uncertain. But when she starts dating a churchgoer, this skeptic begins a surprising journey to faith and love. Rhoda doesn't slide back into the dignified simplicity of the Mennonite church. Instead she finds herself hanging with the Pentecostals, who really know how to get down with sparkler pom-poms. Amid the hand waving and hallelujahs Rhoda finds a faith richly practical for life--just in time for some impressive lady problems, an unexpected romance, and a quirky new family. Rhoda Janzen is the author of the #1 New York Times bestselling Mennonite in a Little Black Dress and the poetry collection Babel's Stair. She holds a Ph.D. from UCLA and teaches English and creative writing at Hope College in Holland, Michigan. Thank you for supporting Rhoda Janzen and your local independent bookstore! 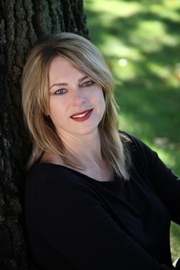 About the Author: Rhoda Janzen is the New York Times #1 bestselling author of MENNONITE IN A LITTLE BLACK DRESS. In 2010, MENNONITE was a finalist for the James Thurber Award for Humor. Not long after Janzen turned forty, her world turned upside down. It was bad enough that her husband of fifteen years left her for Bob, a guy he met on Gay.com, but that same week a car accident left her injured. Needing a place to rest and pick up the pieces of her life, she packed her bags, crossed the country, and returned to her quirky Mennonite family's home, where she was welcomed back with open arms and offbeat advice. (Her good-natured mother suggested she get over her heartbreak by dating her first cousin—he owned a tractor, see.) In her book and presentations she shares with wry humor and huge personality—and tackling faith, love, family, and aging— an immensely moving story of healing, certain to touch anyone who has ever had to look homeward in order to move ahead. Book: What does it mean to give church a try when you haven't "really" tried since you were twelve? At the end of her bestselling memoir "Mennonite in a Little Black Dress," Rhoda Janzen had reconnected with her family and her roots, though her future felt uncertain. But when she starts dating a churchgoer, this skeptic begins a surprising journey to faith and love. Rhoda doesn't slide back into the dignified simplicity of the Mennonite church. Instead she finds herself hanging with the Pentecostals, who really know how to get down with sparkler pom-poms. Amid the hand waving and hallelujahs Rhoda finds a faith richly practical for life--just in time for some impressive lady problems, an unexpected romance, and a quirky new family. Does this church make me look fat? is for people who have a problem with organized religion, but can't quite dismiss the notion of God, and for those who secretly sing hymns in their cars, but prefer a nice mimosa brunch to church. This is the story of what it means to find joy in love, comfort in prayer, and--incredibly, surprisingly--faith in a big-hearted God. What: Rhoda Janzen will discuss and sign her new memoir, Does this church make me look fat?. When: Thursday, October 4, 7:00 p.m. Where: Blue Willow Bookshop, 14532 Memorial Drive, Houston, TX 77079 Admission: In order to go through the signing line and meet Rhoda Janzen for book personalization, please purchase Does this church make me look fat? from Blue Willow Bookshop. A limited number of autographed copies of Does this church make me look fat? will be available for purchase after the event. If you cannot attend the event, but would like a personalized copy of this book, please call us before the event at (281) 497-8675. Rhoda Janzen discusses Mennonite in a Little Black Dress: A Memoir of Going Home. Rhoda Janzen's book Mennonite In A Little Black Dress was available from LibraryThing Early Reviewers. Rhoda Janzen is currently considered a "single author." If one or more works are by a distinct, homonymous authors, go ahead and split the author. Rhoda Janzen is composed of 1 name.